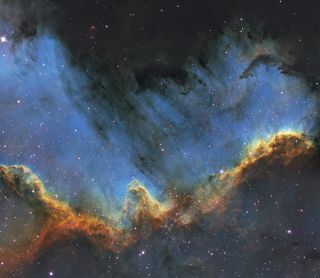 Veteran astrophotographer Bill Snyder captured this image of the Cygnus Wall, which is the most active region of star formation in the North America Nebula. Snyder took this photo over more than 18 hours of exposure in 2013 from Heavens Mirror Observatory in California's Sierra Nevada Mountains. He used a Planewave 17” telescope equipped with an Apogee U16 camera, as well as a Paramount ME mount and Astrodon Ha5nm, OIII3nm, SII5nm filters, to capture the image.